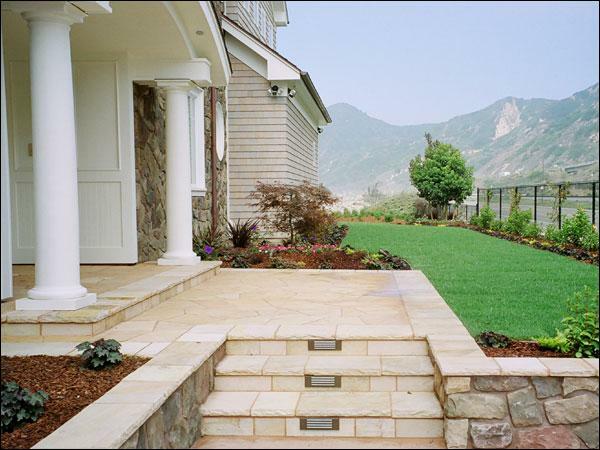 Driveways of Flagstone, Brick, Concrete, Interlocking Pavers | Haney Landscaping, Inc.
Driveways provide an often-overlooked opportunity to enhance the ambience of your home. Whether they are made of brick, Belgard pavers, flagstone, colored concrete, stamped concrete or a combination of any of these materials, upgraded driveways are an integral part of a beautiful landscape. Driveways are now being constructed out of permeable materials. Plastic membranes in the shape of a honeycomb are installed, then filled with gravel, or planted with grass. Concrete versions of the plastic membrane, which are structurally stronger, are also available. Both of these types of system allow for surface water to percolate rather than run down the hard surface and into our sewer and storm drain systems, which is a win for everyone. When making the material selection for your new driveway, keep in mind what you are trying to accomplish. For example, if you are replacing a driveway which has lifted due to tree roots, you may want to replace the driveway with interlocking pavers. This will allow you to make possible future repairs more efficiently and at a reduced cost. Root pruning and placing root barrier materials would also be an excellent choice at this time. Interlocking pavers come in a number of patterns, shapes and sizes. Keep in mind, the most important step in installing a driveway, be it concrete, interlocking pavers or even decomposed granite (D.G. ), is proper subsoil preparation (soil compaction) along with appropriate amounts of base materials, which also should be compacted properly. The depth of these base materials will vary, based on soil composition, traffic conditions and usage, but more specifically, based on the type of material, pavers vs. concrete, that you are installing. While we design and install beautiful driveways everywhere in South and Central California, we primarily serve Santa Barbara, Carpentaria, Ojai, Ventura, Camarillo, Oxnard, Thousand Oaks, Westlake Village, Agoura Hills and Newbury Park.